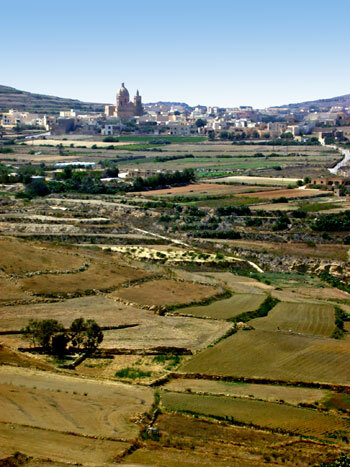 Today, we signed up for a "jeep safari" on Gozo, the third inhabited island. We were picked up at the hotel and driven to the ferry which took us across the channel to Gozo. We were met by our assigned driver, Jerry, but there were no other passengers and no other jeeps to make up a safari. But this turned to our advantage. We passed a jeep safari which was moving much more slowly than us. And they were restricted to a prescribed route. Since we were on our own, our itinerary was much looser. Jerry would take us anywhere on the island that suited us. Of course, we relied on his judgment. Our first stop was The Gozo Heritage. In a converted farmhouse, one walks through a series of historical scenes of local history, from Neolithic man through World War II. It was an interesting introduction to Gozo. 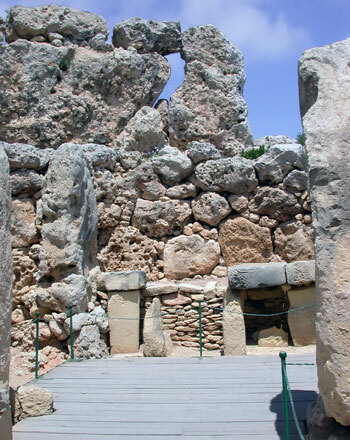 The prehistoric Ggantija Temples, dating from 3600-3000 BC, are the most impressive and well-preserved of all the temples in the Maltese islands. The stone megaliths are so huge that one wonders how humans of that era could have moved them into place. 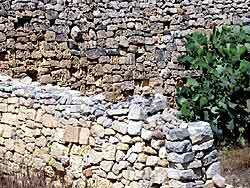 There are two temples within a massive outer wall, each temple having several apses. The roof is long-gone. Our tour-provided lunch was in Xlendi, an old fishing village changed in recent years from a peaceful, beguiling spot to a tourist resort. Like Capri and many other such places around the world, it is best visited at dawn or dusk when the day trippers are gone. The landlocked bay with blue-green waters was not too crowded during our short stay. We climbed steps on a cliff-side for a beautiful view of the bay and its swimmers and scuba divers. Had we followed the path further, we would have come on Carolina's Cave where Dominican nuns once swam and frolicked in seclusion. Dwerja Bay is on the southwest part of Gozo and its seascape is the most spectacular on the island. 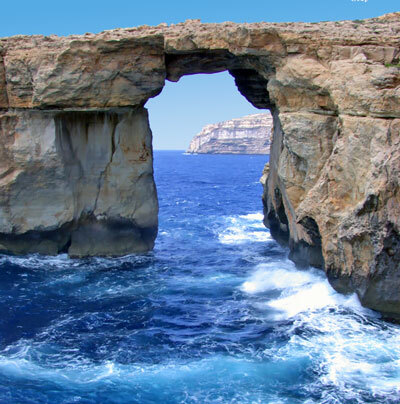 Tieqa Aerqa, the Azure Window, is a great limestone archway created by thousands of years of erosion. Inside the archway is the Inland Sea, a huge landlocked basin of aquamarine-colored seawater surrounded by high cliffs. Even when the sea is at its worst, this is a shallow, sheltered place for swimming. Off to the east is Fungus Rock, once covered with a rare foul-smelling tuber plant that was prized by the Knights of Malta for its medicinal purposes. The Knights decreed the rock off-limits, trespassers to be punished with death or a three-year spell in the galleys. 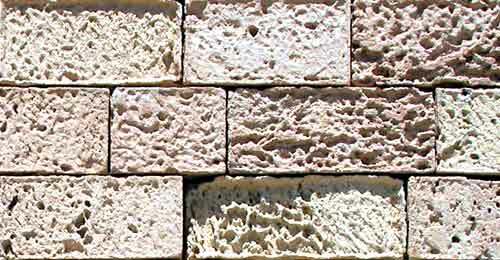 It was later shown that Fucus coccineus melitensis has no medicinal properties at all. Victoria is the new name given to the capital of the island by the British in 1897 to commemorate Queen Victoria's jubilee. To Gozitans and many Maltese, the town will always be Rabat. Rabat means suburb and that is what the town is, a suburb of the Citadel. This site has been inhabited since the Bronze Age and the original fortress was built by the Romans. As late as 1637, the entire population of the island had to spend the night within the fortified walls to avoid abduction by pirates. 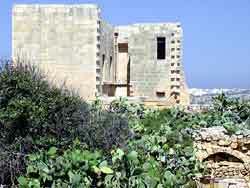 (In 1551, most of Gozo's 5,000 inhabitants were surprised by the Turks and sent into slavery in Libya.) Today, the Citadel houses a folklore museum, armory, natural history museum, cathedral museum, archeological museum, as well as the Cathedral of the Assumption. And from atop the fortified walls one can view almost the entire island. In olden days, it would have been impossible to sneak up unnoticed on the inhabitants of the fortress. The current town below is a rather sleepy place, with one traffic light (they once had two but it slowed traffic too much) and two police stations (one of which is open only 30 minutes a day). The heart of Victoria is the town square. 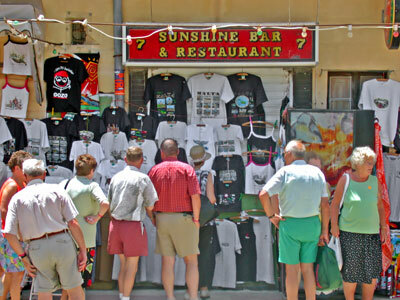 Called Pjazza Indipendenza or It-tock (meeting place), it is where residents gather to gossip and relax. Behind this ficus-ringed square, we visited St George's Basilica, the original parish church which dates to 1678. The most fascinating visit of our day is not found in any guidebook. Jerry took us to see an old friend, a retired mechanic and World War II veteran whose hobby is repairing old machines, such as a 1875 oil pump, and various pieces of army and air force equipment. All sorts of interesting gadgets spring to life at the push of a button, a yank of a cord, or a twist of a valve. This has been his hobby for over fifty years and his large shop and yard are a treasure trove of old machines, engines, and vehicles. Living out back in a couple old World War II vehicles are his chickens and roosters, which provide eggs and one chicken dinner each week. We spent a marvelous hour with him. He wouldn't take any money for himself but was pleased that we put some money into a donation jar for the disabled. We enjoyed our day on Gozo with Jerry. He was pleasant, informative about the island, and full of suggestions of places to visit but willing to let us choose our own itinerary. The tour ended about 5:00 and we ferried back to Malta.